Last night, we started seeing some Tweets from Google employees and others about a new Android-powered Google phone that was apparently handed out at an “all hands” meeting. Now Google is confirming that it is indeed “dogfood” testing a new Android device with employees around the world. There won’t be any negotiation or compromise over the phone’s design of features – Google is dictating every last piece of it. No splintering of the Android OS that makes some applications unusable. Like the iPhone for Apple, this phone will be Google’s pure vision of what a phone should be. The phone itself is being built by HTC, with a lot of input from Google. 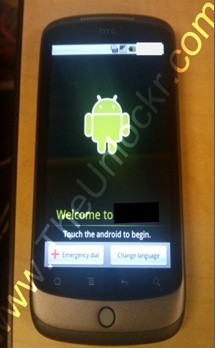 It seems to be a tailored version of the HTC Passion or the related HD2 (Unlocker scored some leaked pictures back in October which are of the same phone). Update: Here is a more recent picture. The phone is “really, really fast,” says someone who has seen one in action. It runs on a Snapdragon chip, has a super high-resolution OLED touchscreen, is thinner than the iPhone, has no keyboard, and two mics. The mic on the back of the phone helps eliminate background noise, and it also has a “weirdly” large camera for a phone. And if you don’t like the touchscreen keyboard, a voice-to-text feature is supposed to let you dictate emails and notes by speaking directly into the phone.